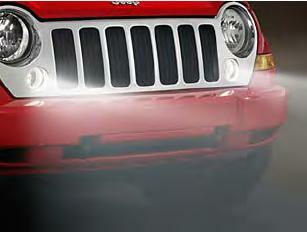 Mopar's Fog Lights for the Jeep Liberty undercut inclement weather and minimize glare. Designed specifically for your vehicle. Mopar Fog Lights are installed for an integrated look. Kit includes a dash-mounted switch, wire harness and fog lights. Fog Lights, mount in grill (2005-2007) or mount in fascia (2002-2004), includes wiring, switch and lights, same as O.E. Please select model year above. Great product... easy to install, and fast shipping. Work just like factory installed. The fog lamps came with all the necessary Mopar installation wiring, relays, lamps and even a new light and windshield wiper arms. I could not be happier with the kit.